Robert Gilman, combined with Robina McCurdy and Rose Diamond, between them bring experience a wealth of experience as educators designers and facilitators involved in such activities as: guiding the Findhorn Community in Scotland through a three month socio-structural transformative process creating a democratically endorsed community constitution and council for self-governance; developing the Household EcoTeam Program for the Global Action Plan; Gestalt therapy and Deep Ecology; and assisting the Tlholego Development Project in South Africa to transform an impoverished farm labourers' village into a demonstration eco-village settlement. On the season of workshops theme, the folks down at Basque Park Community Garden are running some handson workshops over the spring, more details. One of our members is at the US Cohousing conference, which sounds a really exciting event, and I look forward to some news to share about it. 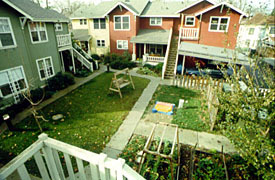 While on cohousing, there is a decent search engine for the cohousing list archive, which is avialable to anyone and is actually a wealth of info, Coho-L Search. Lets not reinvent the wheel. It seems like there is a huge amount of positive energy flowing at the moment, and a couple of important websites that have come my way are examples: Network New Zeaand and Resilient Communities . The Permaculture Institute of NZ is also revving up, with a new email list, details. Well, it also a busy time, so I'll be brief. In ending, I saw one of those Church billboards the other day, which said: "Springtime--evidence of gods love", and while not being a church goer, with the weather and the copious abundance of blossum, I wasnt about to argue with that.